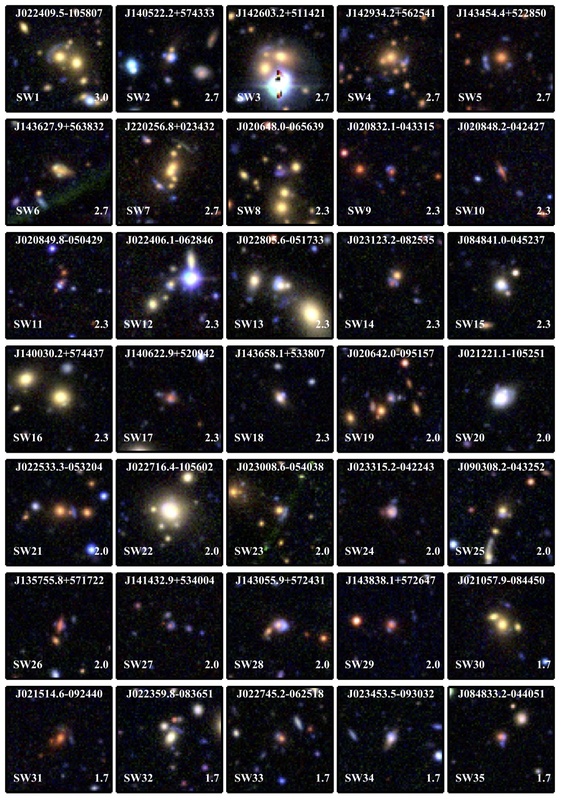 One of the objectives of the Space Warps project was to find gravitational lens candidates that have been missed by previous computer algorithm searches of the CFHT-LS. We are very excited to be able to show you a few of the new objects that have been found by the Space Warps community, and are currently under discussion in Talk. They are what we would consider to be highly probable lens candidates, and have not been found by the automated searches in the CFHT-LS. These are examples of exactly what we were hoping the Space Warps project would find with citizen scientists – so well done everyone!!! The first of the candidates is ASW0004dv8. Here, the collective mass of the foreground group of yellow galaxies (primarily the two bright galaxies) is large enough to bend the light of a blue galaxy lying behind forming a beautiful blue arc. There are some fainter and smaller yellow galaxies spread across the field that are also likely to be members of the galaxy group. Such galaxy groups (and the more massive clusters of galaxies) mark the most massive and dense regions of dark matter in the Universe. In contrast, the background blue galaxy that is being lensed into an arc is of much lower mass. It’s blue because it has many younger stars, and only just forming the bulk of its stars. In contrast to the large blue arc in ASW0004dv8, there are also easy-to-miss, compact arcs like ASW0003wsu. On a quick glance, the nearby bright star might have grabbed your attention sooner than the potential lensed arc. Just to the left of the star in the image below, there’s a nice clear arc next to the yellow lensing galaxy. 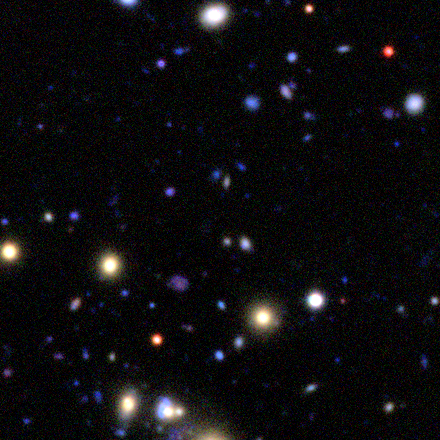 Other similarly coloured yellow galaxies in this image that may form a galaxy group. Another interesting system is at the bottom of ASW00047ae. These are very different lenses to the galaxy group lenses above with distinct blue arcs. Rather, in these examples a blue, compact background galaxy or quasar is being lensed by a single foreground galaxy into multiple discrete images. In these cases, the lensing galaxy is the red galaxy at the centre of the zoomed in images above. 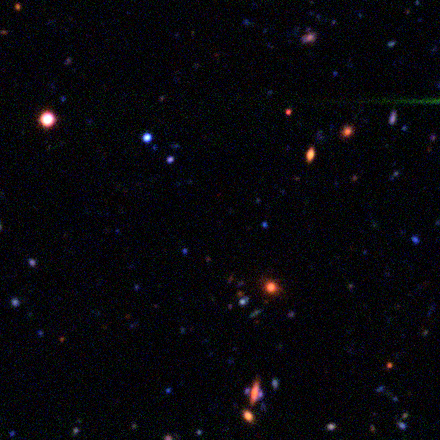 There are actually 2 red galaxies seen in ASW0004q9e but the galaxy with the blue images around it is the primary lens. As with ASW00047ae, we would need to model the system to see if the second red galaxy had an impact on the lensed images. There are two images of the background blue quasars or compact galaxies in ASW0005mp6 and ASW0004q9e. 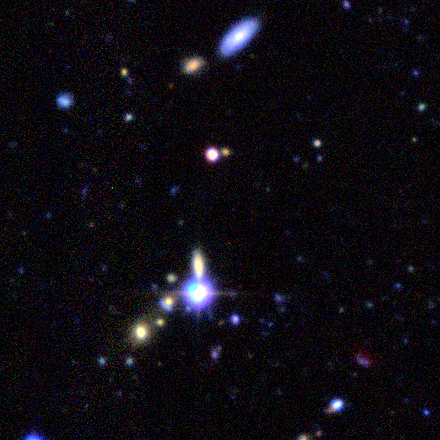 In ASW0001yqb there are three distinct images of the blue background galaxy, arranged in a circular fashion around the lens. 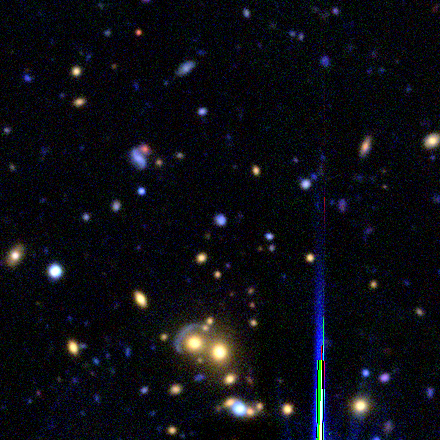 In ASW0001yqb and ASW0004q9e, the blue images of the lensed background galaxy are so bright that they almost overshadow the red light of the lens. 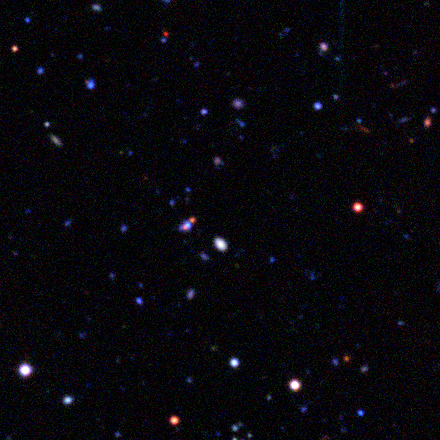 Note the colour of this lensing galaxy is much redder than the yellow colour of the lensing galaxies in the examples of blue arcs shown above. These red lenses must lie at a higher redshift than the yellow galaxy groups, i.e. 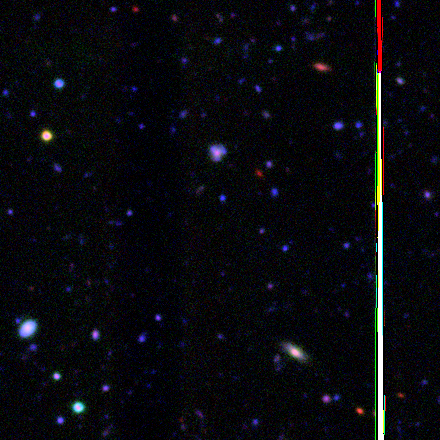 the strongest emission from this type of galaxy, seen in yellow in ASW0004dv8, moves into the redder bands at higher redshift making the galaxy appear red rather than yellow. Among all of the candidates shown here, ASW0001yqb is probably the hardest to identify. It is a very compact system and it is not easy to differentiate the three blue images of the background galaxy from the faint, red, central galaxy. In fact, ASW0001yqb is very similar to a lens found by the RingFinder computer algorithm of Raphael Gavazzi et al. seen in ASW0000x1l. ASW0000x1l has been confirmed to be a gravitational lens by the SL2S team but just hasn’t been published yet! The similar ASW0001yqb was not found by RingFinder, this demonstrates how Citizen Scientists have a vital role to play in identifying potential lenses missed by the algorithms and therefore providing key information on how to optimise lens finding algorithms. Raphael is going to help us do a complete cross-check between the RingFinder and Space Warps samples, when we have them. How did the Space Warps Community collectively classify these lens candidates? The lens candidates shown here were selected from good lens candidates that are being discussed in Talk.In our last blog post, we described what happens after you have made your clicks, the way we analyse your marks to remove images that don’t contain lenses and select potential lens candidates from the stream. 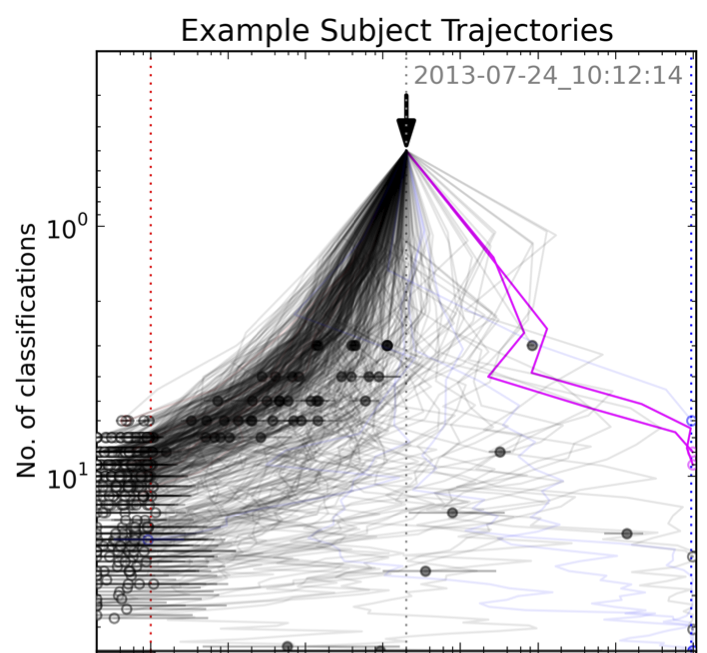 The following image is the same trajectory plot explained in the “What happens to your markers” blog post. The probability of being a lens is shown increasing from left to right, and the number of classifications increases from top to bottom. Lens candidates, as voted by you when you mark images, appear on the right hand side of the plot as with each mark they aggregate a higher probability of being a lens. The two magenta lines shown are the tracks for ASW0004dv8 and ASW00047ae that we discussed above. You see both track move to the right hand edge of the plot meaning that you collectively voted that these systems are very good lens candidates! ASW0004dv8 was classified as a highly probable lens candidates after 9 classifications (the upper magenta track) and ASW00047ae, after 8 views (lower magenta track). That’s excellent, it means that our collective classifications are producing very probable lens candidates after only ~10 views. We’ll be blogging about more highly probable candidates from the early dataset releases as they come up – and we are putting together a sample of candidates from the collective classification for us all to analyse further. These first examples demonstrate how well the Space Warps community is doing. Thanks for all your hard work and we’re looking forward to some exciting times ahead!